The newest name on this list, Gran Eléctrica hit the scene hard mere months ago. Creative renderings of Day of the Dead skeletons (each scene set in DUMBO) cover the walls, setting the scene for the fiesta of street food, which ranges from the adventurous (sweetbread tacos) to the amazingly authentic (pozole rojo). But it was two words that won the argument for Gran Eléctrica: scallop ceviche. 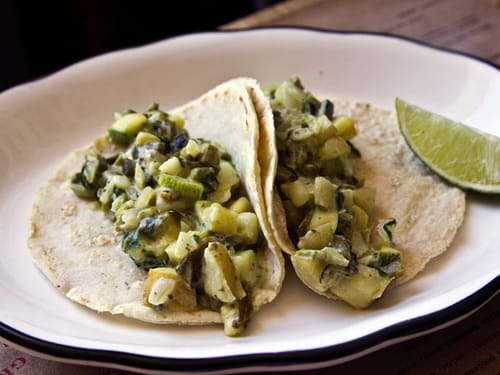 For novelty-seeking palates, there is nothing more satisfying than the aguachile: raw scallops with a delicate texture not found in the seared variety, enlivened by the punch of herb puree. The gordita is also a thing of wonder. Not just because we rarely see it on menus (save for Taco Bell's greasy version) but because it is made with chicharron. It is a beautiful mess of crema, queso fresco and chicharron fried in pork fat. It's probably terrible for us, but who cares?